The Grand Canyon was previously inhabited by two native american tribes: The Hualapai and the Havasupai. Before park regulation and Indian removal, the Havasupai lived and farmed around the Havasupai Falls and Phantom Ranch. Small homes existed where they would grow fruitful crops in the summer. Around October or November, families would pack up and leave for grazing lands on the rim, offering more temperate weather in the winter. 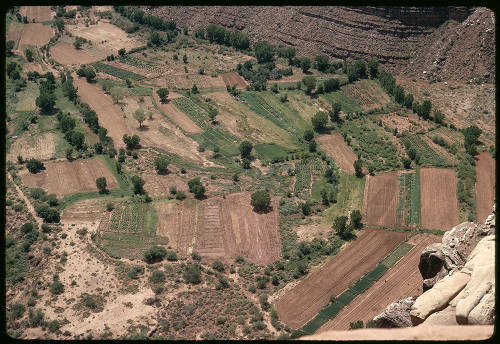 The Havasupai would live primarily off of produce in the summer, when crops were abundant. In the winter they relied on small game and foraged goods. As settlers removed land from the Havasupai, their methods of living were drastically altered. 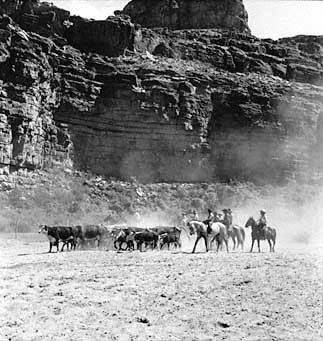 They could no longer head for refuge on the plateau in the winter and instead were required to cure foods for the winter or hunt within the 60 acres of canyon land they were given. As of present day, about 200 Havasupai still live in the canyon in a census-designated place called Supai. Farming has shrunk considerably and most food must be obtained from the rudimentary grocery and cafe. More history on native peoples of the canyon can be found here. Supai - Round-up pic on rodeo ground 8/41. Havasupai men and boys work stock along the sand floor of their canyon reservation, 3000 feet below the rim of the Grand Canyon.